Learning English was three women’s means to their dream. Going into healthcare in the U.S. was the dream. The Wichita Indochinese Center and Butler Community College provided these immigrants the opportunity to accomplish both these goals. This semester, along with offering English as a Second Language (ESL) classes, the Wichita Indochinese Center in partnership with Butler Community College offered a certified nursing assistant (CNA) course. In August, Flor Mancilla, Edith Cabral and Maryam Nahavandi enrolled in this course. Their English had reached high school proficiency. On Oct. l9, these three women celebrated. All three passed the CNA exam. Mancilla, 50, was a pharmaceutical representative in Guatemala. She said she is blessed to have this opportunity. “My next step is to become a certified medical assistant (CMA),” Mancilla said. Mancilla hopes to one day become an X-Ray Technician. She’s cleaned houses since she arrived in the U.S. Now, she is interviewing at nursing homes. Next semester, she will continue to take ESL classes and begin a certified medical assistant (CMA) course. Although from Peru, Cabral, 53, has a similar path. She too wants to become a CMA. Both women said the Indochinese Center helped them assimilate. Nahavandi, 31, already has her bachelor’s degree in accounting from a college in Iran, her home country. But she always wanted to go into healthcare. Because of Butler and the ESL program she is able to follow her dream without going into debt. Nahavandi, who already speaks several languages, plans to begin nursing school next fall. All ESL students who plan to take the CNA course at Butler are required to take the pre-CNA course as well. “This course introduces the students to different types of health care professions. We introduce all the possibilities,” said Sherry Watkins, director of Adult Education at Butler. Butler provides support labs two times a week for ESL students. This support helps the students understand medical terminology. The state-sponsored program, Accelerating Opportunities in Kansas (AO-K), funded these students to attend the GED and CNA classes and have classroom support as part of the AO-K pathway. Butler has the AO-K pathway in Allied Health and will soon introduce the Engineering Technology path. Adult students without a Kansas High School Diploma can take certain classes in these degree programs, as well as GED classes for free. These pathways help learners obtain educational training that propels them to obtain family-sustaining wages. AO-K focuses on providing training with supportive services that lead to employment opportunities. This is training that adult students might not have access to otherwise. The Wichita Indochinese Center is located is a non-profit organization and is located at 2502 E. Douglas Ave. in Wichita. Call 316.689.8729 for more information. Or email them at wic@wichindo.com. 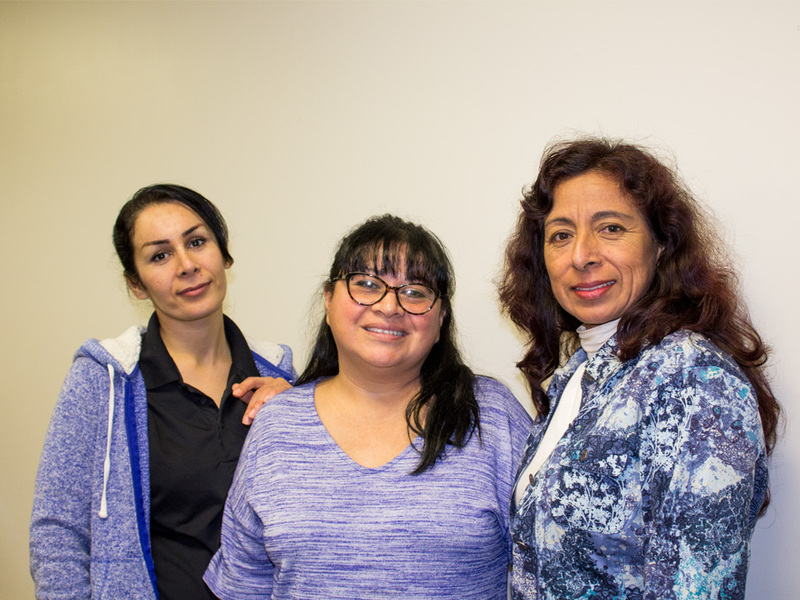 Cutline: Maryam Nahavandi of Wichita, Flor Mancilla of Andover and Edith Cabral of Wichita complete their CNA course at Butler.